Hot off the Press - Bag It Cordova Success! EPC's Bag It Cordova project made more than an impact - the Cordova City Council unanimously passed a ban of point of purchase single use plastic bags AND polystyrene (Styrofoam) take-out food containers that will go into effect October 1, 2016! We handed out our Reduce-Reuse-Recycle canvas bags, collected petition signatures and helped make this Ordinance happen. 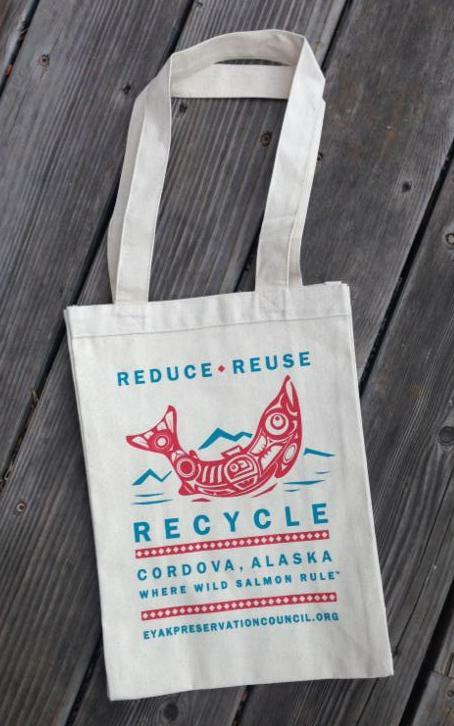 Cordova historically distributes over 1 million single use plastic bags a year that invade the environment, ocean and landfill. Thank you Cordova for moving towards a healthier and cleaner environment! In December Program Manager Emily Stolarcyk is heading to California to a Rockwood Leadership Institute - Art of Leadership training. The task of forming a clear and articulate vision for social impact work in these challenging times can be a daunting undertaking. Those of you that have taken the Rockwood training know that it is a 5-day intensive retreat that focuses on powerful visioning, teambuilding, successful communication, collaboration and positive social change for emerging leaders. We are excited to see what new skills Emily will bring back to Alaska! EPC continues to lead the way addressing the Navy's plans for military trainings in the Gulf of Alaska, researching not only what really happened in Northern Edge 15, but also when, where and what is going to be allowed in Navy trainings in forthcoming years and how the public can make a difference. The final supplemental EIS is going to come out in early 2016 and will need public participation and comments. Join the Defend Our Ocean campaign- we welcome coalition partners! We will be posting on Facebook, in EPC Alerts and reaching out when the public comment period opens. The Forest Service says YES, the Seller says YES, the surrounding private landowner says YES - so now this is a 75,000-acre opportunity to save old growth, wild salmon habitat, commercial fishing, jobs, subsistence, and keeping coal in the ground to fight climate change, yet MAJOR $$ and energy is needed to take this historic, precedent opportunity across the finish line. Our partners, the Pinchot Institute of Conservation, Theodore Roosevelt IV and Jane Goodall are all willing to talk with you about how you can help. Yes, let's take this step for an investment in forever. Get in touch with us! Have you enjoyed Copper River salmon? It's the best! You know this is a sustainable regional fishery thanks to efforts (including EPC's) to preserve wild salmon habitat. The Copper River Salmon returns were healthy and vibrant this year. 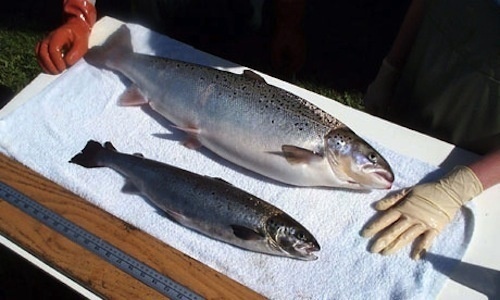 But the news about the FDA clearing the way for genetically modified salmon is NOT! The GMO fish do not have to be labeled as such. Hats off to Alaska standing in solidarity against the legislation. A very special thanks to the recent contributions received, and to the significant donations from Alaska Glacial Mud Co - a home-based Cordova business that makes a superior locally harvested, from the Copper River Delta, facial skin care masque. And to Timothy Metz and Susanna Colloredo - whose gifts were matched with donations from folks like YOU that have helped our preservation work in these challenging times. We look forward to this season of sharing and giving. We invite YOU to help EPC - let us know and we will arrange a pledge drive to match your donations! The Eyak Preservation Council has board positions open. We are looking for dedicated people with non-profit operations, fundraising abilities and in-depth knowledge about Alaska and a passion for wild salmon habitat pristine eco-system preservation and all that means culturally and spiritually. Email us at eyak@redzone.org, tell us about your interest and how you want contribute to helping us in our mission's work.